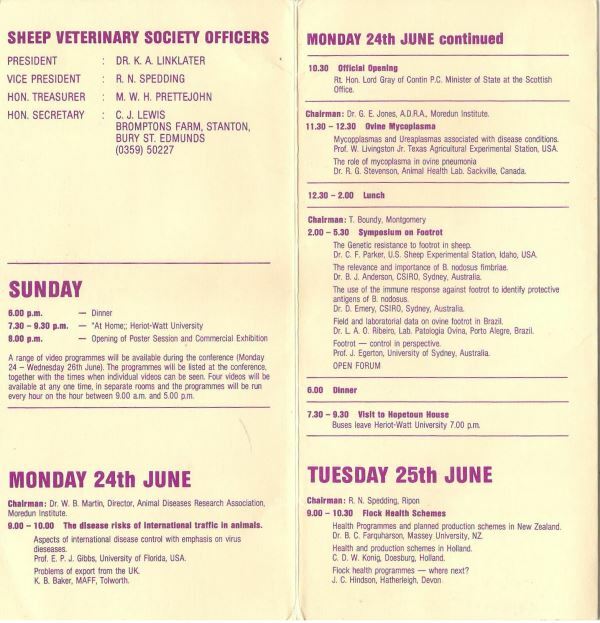 Two very successful Sheep Fairs were run at the Galashiels College of Textiles and the St Boswells Veterinary Investigation Centre in the Scottish Borders in 1977 and 1981. These were organised by the East of Scotland College of Agriculture (ESCA) in conjunction with the Sheep Veterinary Society (SVS). They attracted a large number of delegates not only from all over the UK but also from overseas. Karl Linklater who was the Senior Veterinary Investigation Officer in charge of the St Boswells VI Centre at that time was responsible for most of the planning and organisation of these events. When he became President of the SVS he suggested that as these meetings had outgrown the local facilities and as there was an obvious international demand for this type of meeting, the SVS should take over and run an International event (conference) possibly at a University Campus in Scotland. The format was to be based on a combination of that of the traditional SVS meetings and that of the Sheep Fairs and the Heriot-Watt University in Edinburgh was chosen as the venue. The organising group was made up of the office bearers of the SVS at that time, viz President Karl Linklater, Secretary Chris Lewis, Treasurer Mike Prettejohn and Vice President Neil Spedding. 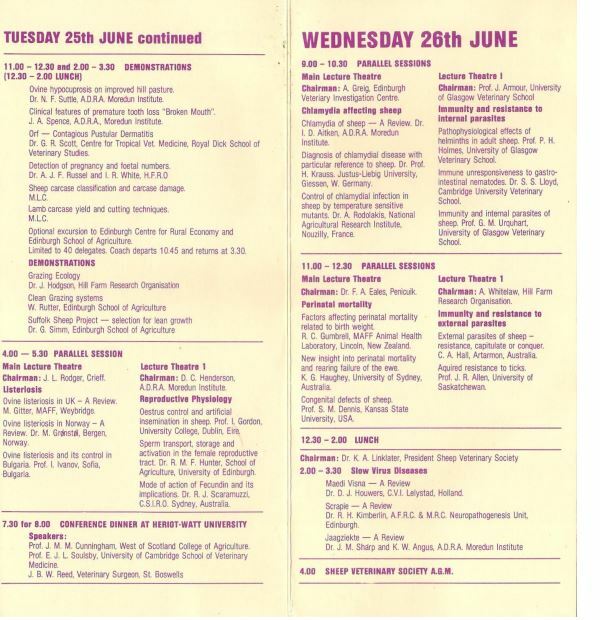 In those days universities were keen to send delegates from their faculties to such meetings at the universities cost. The main session headings were agreed and invitations sent out to speakers. At the same time the conference was advertised as widely as possible, but being the first, some countries were omitted due to lack of UK contacts. Sponsorship was forthcoming from 20 organisations, interestingly only 3 of which exist today (2013). In all delegates registered from 23 countries and the maximum attendance was on the Tuesday with 123 present. Thankfully no unregistered delegate arrived as the accommodation was fully booked. A single room came available when one Scottish delegate was temporarily arrested for the possession of a variety of shotguns and rifles in his car. Apparently he had driven directly from a hunting holiday! The whole of registration was handled by the secretary and treasurer and Chrissie Nicholls from the British Veterinary Association assisted with the publicity. The conference opened with dinner on the Sunday evening followed by an "At Home" and the opening of the posters and commercial exhibition. Twenty two posters were presented with a real international flavour from Egypt, India, Netherlands, Iraq, and Canada in addition to those from several UK Research Institutes and Universities. All 20 sponsors participated in the commercial exhibition. During the "At Home" reception delegates were entertained by a demonstration of traditional Scottish Country Dancing organised by SVS member, Ben Mitchell, and friends. The opening session on the Monday considered "The Disease Risks from International Trade in Animals" with keynote speakers Paul Gibbs from the University of Florida and Keith Baker from MAFF, London. This was followed by the official opening by the Rt. Hon. Lord Gray of Contin, Minister of State at the Scottish Office with responsibility for Agriculture. Further scientific sessions that day covered "Ovine Mycoplasmas" and a "Symposium on Footrot", the latter notable for a contribution by the world's leading authority, Professor John Egerton from Australia as well as papers from Brazil and the USA. Tuesday morning opened with a session on flock health schemes with contributions from Bruce Farquharson (New Zealand), C D W Konig (Holland) and Jim Hindson (Devon). There followed a series of six practical demonstrations with topics including "Hypocuprosis on Improved Pastures", "Broken mouth", "Orf – Contagious Pustular Dermatitis", "Scanning to Detect Pregnancy", "Carcase Classification" and "Cutting Techniques". An excursion for 40 delegates was made to the Edinburgh Centre for Rural Economy and the Edinburgh School of Agriculture. Demonstrations there included grazing ecology and clean grazing systems. In addition the first public detail of the Suffolk Sheep project majoring on selection for lean growth was described - this subsequently led directly to the Suffolk Sheep Society indexing of sires. Two parallel sessions on "Listeriosis" and "Reproductive Physiology" were run in the afternoon. Professor I. Ivanov had accepted the invitation to give a paper on "Listeriosis control in Bulgaria". This was still the time of considerable cold war tension and he was accompanied by a minder with a very obvious shoulder holster. His slides were old fashioned glass ones. In the preparation room they were fine in the projector, but the first crushed in the lecture theatre projector. John Rodger the chairman carried off the disaster with aplomb but resolutely refused ever to chair a session again. Wednesday morning opened with parallel sessions on "Chlamydia Affecting Sheep" and "Immunity and Resistance to Internal Parasites". Later further parallel sessions reviewed "Perinatal Mortality" and "Immunity and Resistance to External Parasites". The final session of the conference was chaired by the President and explored the problems of "Slow Virus Diseases". There was no pre-conference tour. A programme for accompanying persons was put on, described as a "Non-scientific social programme". On Monday there was a full day visit to Dema glass and Clan Royal. On Tuesday there was a tour of Edinburgh and on Wednesday a free day in Edinburgh. The first of the evening social programmes was the "At Home" reception on the Sunday night at the conference venue. The second event was a visit to Hopetoun House on the Monday evening after dinner. Hopetoun house is the largest and oldest stately home in Scotland set in over 6000 acres. It has remained in the same family since the late 1600's and contains many priceless antiques and paintings. Tuesday evening saw the Conference Dinner set in the main hall at Heriot-Watt. Three eminent speakers entertained the delegates, viz Professor Ian Cunningham, Principal of the West of Scotland College of Agriculture, Professor Lawson Soulsby, President of RCVS later to become the first ennobled veterinary surgeon, and John Reed, a veterinary surgeon in large animal practice in St Boswells in the Scottish Borders. After the speeches an informal concert took place with Caroline (Boonie) Bower wife of John Bower on guitar accompanied by increasingly raucous singing from well lubricated delegates. Some statistics. Of the 33 papers presented 22 were by overseas delegates. America provided 4 of the speakers with Canada (2), Australia (6), Brazil (1), New Zealand (2), Netherlands (2), Norway (1), Bulgaria (1), Eire (1), West Germany (1) and France (1). A meeting of delegates from the various countries decided that the concept of International meetings should be continued every four years and it was decided that New Zealand would host the next International meeting in 1989. There is no doubt that the success of the first meeting has led to conferences every four years which have developed, matured and evolved into the creation of the International Sheep Veterinary Association (ISVA). Chris Lewis, Secretary and Joint Organiser of the First International Sheep Veterinary Meeting. Karl Linklater, President of the Sheep Veterinary Society, 1983 – 85.